Get slim, shapely legs and thighs and build a firm, perky tush with this high-intensity lower body workout. A complete strength and cardio circuit that will help you sculpt lean and strong muscles and burn off body fat fast! Start this high intensity workout with a lower body warm up routine. 1. Squat thrust: 45 seconds. Stand straight with your feet shoulder-width apart. Squat and place your hands in front of your feet. Jump back and get into a push-up position. Jump again, bringing the legs toward your palms and stand up. 2. Pilates grasshopper: 60 seconds. Lie on your stomach with your hands under your chin, your knees wide apart, the legs bent, and bring your feet together. Point the feet toward the ceiling and raise your thighs off the floor as high as you can. Lower your thighs back to the floor and repeat the movement for 60 seconds. 3. Skaters: 45 seconds. Lean forward, jump to the right, bring your left foot behind you, and bring your left arm in front of you. Jump to the left, bring your right arm in front of you and your right foot behind you. Repeat this back and forth movement until the set is complete. 4. Booty squeeze: 30 seconds + 30 seconds. Get down on your hands and knees, place a dumbbell behind your right knee, and raise your leg out to the side. Bring your right foot toward the left glute and squeeze. Return to the initial position, repeat for 30 seconds and switch legs. 5. Dumbbell swing: 45 seconds. Stand with your feet shoulder-width apart and hold a dumbbell with both hands. Squat and bring the dumbbell between your legs. Stand up and swing the dumbbell up to about chest height. 6. Wall bridge: 45 seconds. Lie on your back with your arms by your sides and plant the soles of your feet on a wall. Squeeze your glutes and raise your hips as high as you can. Return to the starting position and repeat for 45 seconds. 7. Jump start: 30 seconds + 30 seconds. Stand on your left leg, bend your knee, extend your right leg back, and touch your left foot with your right hand. Jump quickly, drive your right knee up and land softly on your left foot. Repeat for 30 seconds and then switch sides. 8. Single leg deadlift: 30 seconds + 30 seconds. 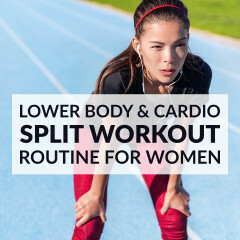 Grab a set of dumbbells, stand on one leg and start bending at the hips. Lower your upper body until you’re parallel to the floor and extend your free leg behind you. 9. Jump squat: 45 seconds. Stand with your feet shoulder-width apart and the toes pointing slightly outward. Bend your knees pressing your hips back, and then push through the heels to jump straight up. 10. Diamond kicks: 60 seconds. Lie on your back, raise your legs toward the ceiling, bend the knees and bring the soles of the feet together. Extend the legs out to the sides, as far as possible, and then squeeze the inner thighs to bring the legs together. Repeat for 60 seconds. Finish this high intensity lower body workout with a set of static stretches. 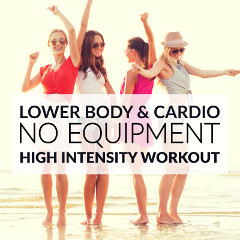 Sculpt lean and strong muscles & burn off body fat fast with this lower body HIIT workout!